Kinsey has epilepsy. Her condition is so severe it affects nearly every aspect of her life. Things other kids take for granted are simply not safe for her, like riding a bike. And friendships are hard to form when other kids just don’t understand. Her parents want what’s best for Kinsey, but sometimes knowing the right path for their daughter is just a guessing game. So, when things have reached an all-time low for Kinsey they take a big risk both personally and financially when they decide to get a service dog for Kinsey. Their hope is that this dog will be able to anticipate a seizure before it even happens, giving Kinsey the opportunity to be prepared before an epileptic event strikes. From the moment Kinsey meets her new service dog, Drake, her life turns around for the better. But before long she is facing yet another problem. When she starts middle school, a bully turns her happy new life upside down. It’s just not fair that just when Kinsey was starting to feel normal, Taylor Thompson has to go and make her life miserable. 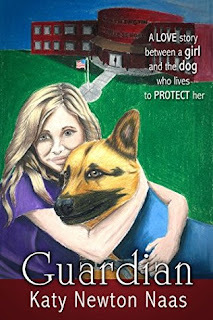 Author Katy Newton Naas’s Guardian is a wonderful and entirely engrossing book. Readers will feel an instant connection with Kinsey and her loveable dog, Drake. Kinsey’s story highlights the issues so many kids experience when they suffer from health concerns. It’s not easy when all they want is to be like other kids. Young readers will feel Kinsey’s pain as she is first left out, and later shunned by students who just won’t give her a chance. A compelling story that will warm hearts and inspire positive change, Gaurdian is recommended for home and school libraries and has earned the Literary Classics Seal of Approval.